From all of us at Martin Pierce to all of you we wish you a happy 4th may your dogs and ravens be safe. We have just completed an order for Gecko cabinet pulls in interesting and contrasting finishes. The bright gecko is an example of brushed natural bronze, a finish created by buffing the gecko on a buffing wheel. The dark gecko is also buffed but to a lower luster and then dipped in a solution of M20 to create an overall black appearance. 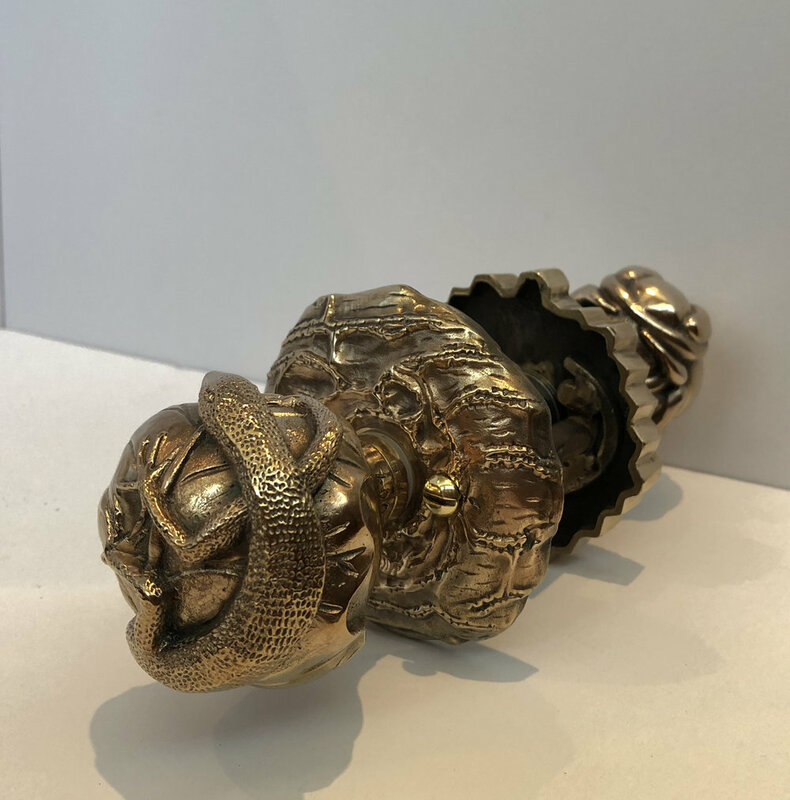 The gecko is one of 2 lizard cabinet knobs and forms part of a compete series of lizard door hardware that includes entry door sets and interior door handles. These 2 pieces serve as a good visual approximation for the industry finishes US4 (satin bronze) and US10B (dark satin bronze) which is described below. Using M20 by Birchwood Technologies we make a solution using 1-part M20 and 1-part distilled water mixed in a non-reactive dipping vessel. The piece is immersed for 30 to 60 seconds and then neutralized by immersion into another vessel of distilled water. If upon inspection we see that certain areas have not reacted to the solution and are still bright we re-clean those areas and dip again. The chemical conversion creates a uniform patina so to accentuate the gecko’s markings we gently burnish selected areas by hand with a fine nylon abrasive pad and thereby re-expose the golden tones of the bronze casting. To seal the bronze, we use a soft cloth to apply 2 coats of oil and once dry finish with hard wax. There are many products to choose from we have found Sculpt Nouveau’s metal oil and black wax easy to work with.